Saturn V Third Stage Directional Control Fuel Vent Valve manufactured by CALMEC Corporation for Douglas Aircraft Corporation (primary integrator for the S-IVB under NASA Marshall Space Flight Center Contract NAS7-101). 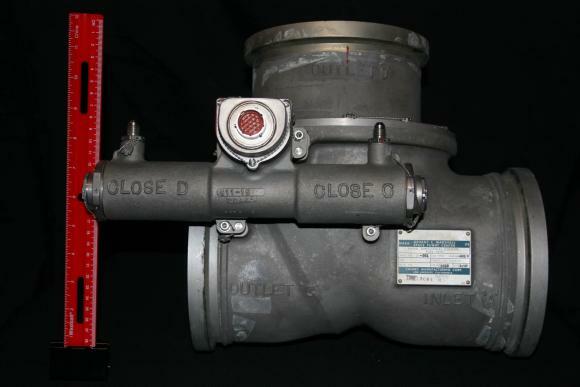 During ground fueling operations, the valve routed Gaseous Hydrogen (GH2) overboard to the burn pond via the LH2 Ground Vent Disconnect Coupling (an example of which can be seen below in this collection). During flight, the control valve diverted GH2 though the stage non-propulsive vents for expulsion into space, or via the propulsive vents to support stage Ullage augmentation (propellant settling) in concert with the Auxiliary Propulsion System (APS). The valve was pneumatically operated utilizing 475 psig gaseous helium from onboard storage tanks.